Monteverde is one of the most ideal places to take a breather and enjoy nature's best. Hiking through its abundant cloud forest and spotting natural wildlife along the way make it the greatest chance to get intimate with nature. Pick any one of our Monteverde Nature & Eco Tours and we can guarantee your cloud forest experience will be a memorable one. There are a number of eco tours that backpackers can choose to experience on their vacation in Monteverde. One of our top pics is the Monteverde Hanging Bridges Tour which is one of the regions first systems of suspension bridges. This 2 mile trail through the Monteverde cloud forest reserve that allows people to get up close and personal with the wildlife in the canopy with their feet planted firmly on the ground. With Monteverde Sky Tram and Sky Walk Hanging Bridges, the open air gondolas will take you up, up, up in the air--up to 5,250 feet high!! From there, take time to pause, take out your cameras and explore the marvels of flora and fauna before zipping back down to the headquarters. Now that is a super adventure in nature! 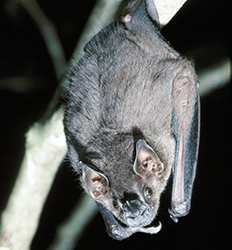 Another spot that you mustn't miss is the Monteverde Bat Jungle. It's a first-class bat exhibit amid Costa Rica's cloud forest region. It's the result of 40 years of thorough research by Dr. Richard Lava, a talented citizen of Monteverde. If you're the type who seeks out unique adventures, a whole new experience is waiting for you in the beautiful Monteverde Cloud Forest. With Finca Modelo Night Walk Tour, you can start an exciting night-time trail along with the nocturnal animals who come out to play (or prey) as the sun goes down. If a well-defined cultural experience is what you're after, Monteverde Dairy Farm Tour can be a great choice. This is an eco-educational farm tour that opens a wide door for a surprising beauty that nature unfolds. Here, you won't just learn about how organic dairy is created, you can also be actually part of it. This is a great tour for the whole family to enjoy. Gentle hikes, hanging bridges, aerial trams; choose your favorite Monteverde Eco Tour and start exploring Costa Rica's cloud forest today! Tour Deals! The Costa Rica´s cloud forest is truly unique, and should be discovered on an equally unique excursion. 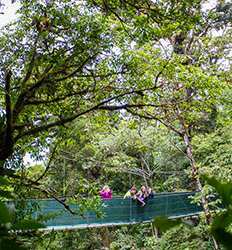 On our Monteverde Hanging Bridges Tour, impressive feats of engineering meet impossibly lush forest on a mellow 2 mile trail walk through the Monteverde Cloud Forest reserve. Our day starts on the Monteverde Sky Tram where we will ascend up to an elevation of 5250' in our open air gondolas giving you the chance to pause and learn about the flora and fauna of Monteverde's cloud forest before zipping back down to our operations base. This tour option is "Without Lunch", for more options see details. 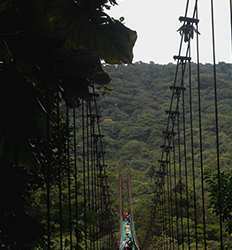 Monteverde Sky Tram and Sky Walk Hanging Bridges deposit is $5.00 per person. Of all the things to do in Monteverde, The Monteverde Bat Jungle is a world class bat exhibit that should not be missed when visiting Costa Rica's cloud forest region. It is the culmination of 40 years of worldwide research by Dr. Richard Laval a long time member and outstanding citizen of the Monteverde community. As the sun sets quietly over the Monteverde Cloud Forest, an entire new experience awaits you in the beautiful jungle. 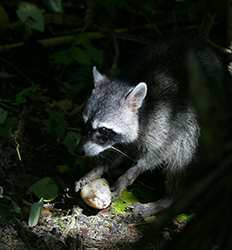 Head out into the trails and experience the nocturnal animals who rule the evenings in our Finca Modelo Night Walk Tour! What´s more beautiful than a Costa Rica sunset? Few things in life. Finca Modelo Night Walk Tour deposit is $5.00 per person. Do you like to march to the beat of your own drum? Kick the large, super-structured hiking tours in Monteverde Reserve to the curb and jump on board with the Brennes Family. On our own private reserve in Costa Rica, you can customize your own exciting Waterfall Hike in the cloud forest at Finca Modelo! 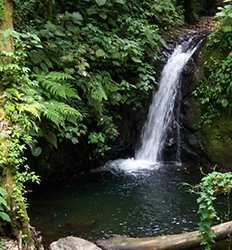 Finca Modelo Waterfall Hike in the Cloud Forest deposit is $5.00 per person.